Learning to drive is certainly a challenge. Your driving lessons will be full of ups, downs, moments of pure joy and times when it feels like nothing is going right. Although it’s a long road from novice driver to license holder, the day you pass your driving test will definitely be one of the most exciting. Once you’ve passed your test and are legally able to own a car, it opens up a world of possibilities and it really is a life changing event. For a number of people who have passed their driving test, they’ll never need to take another driving lesson again, however for a variety of reasons, as time passes, some individuals may feel the need for extra tuition to improve upon areas of their driving they are not happy with. The extra lessons you take after you’ve passed your test are commonly known as refresher driving lessons and they’re becoming increasingly popular with more and more people. Who Takes Refresher Driving Lessons? There are lots of people who own a driver’s license but currently don’t drive on a regular basis. For such individuals, getting behind the wheel after a period of inactivity can be daunting and extra tuition to clear the cobwebs is usually a smart decision. Road accidents are extremely traumatising for everyone involved. As anyone who has been in an accident can testify, It’s easy to lose of confidence in your driving ability following an serious incident and in such cases, refresher driving lessons are excellent way to regain some of your lost confidence and help you get back on the road as soon as possible. Passing your driving test doesn’t automatically make you an expert driver, it just means you were able to pass the designated test. Although it may seem counter intuitive, there are lots of people who don’t feel ready to drive consistently even after passing their test and in these situations, refresher driving lessons can provide the extra skills needed to drive on a full time basis. If you’ve been disqualified from driving or have accumulated a number of points on your license for a particualr infraction, the courts may compel you to take a certain number of refresher lessons, before being allowed back on the road. In such situations you won’t be able to return to your normal routine, till you complete the mandatory number of hours. What Type of Driving Instructor Should You opt For? In most cases, people who are looking for refresher driving lessons, know beforehand what areas of their driving they’d like to improve upon. Understanding what you’d like your lessons to focus on makes it slightly easier to find a driving instructor to work with. A great way to determine whether the driving instructor you’re speaking with will be a good tutor, is to tell them the area of your driving you would like to improve upon and ask them to explain how they would go about helping you do this. If they are able to present a detailed plan of how to correct the issue, along with examples of previous students they have helped solve the same problem, they’re certainly a driving instructor you should seriously consider working with. The amount of lesson an individual needs varies from person to person. In truth it really depends on which areas of your driving you want to improve. 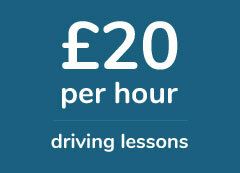 In general most refresher driving lessons consist of 6 hours of tuition and these are normally taken in 2 hour blocks. Assuming you only want to work on a couple of areas, 6 hours tuition should be adequate, however it’s not uncommon for individuals to request further tuition at the end of the initial booking, if they do not feel ready to get behind the wheel. What Things Can I Work On During The Refresher Lesson? Let’s face it driving on motorways especially for long distances, is not everyone’s cup of tea. There are lot’s of individuals who don’t feel comfortable on these roads and whether it be switching lanes at speed, overtaking or judging your speed, there are several aspects of motorway driving that a number of people struggle with and in such situations refresher lessons can make a big difference. It’s relatively easy to drive when the conditions are good. however when visibility is impaired for example at night, or when the weather is bad, it quickly can become difficult. For people who struggle to drive in unfavorable conditions, refresher lessons can help overcome a quite common problem. Driving through busy town centres requires a special kind of concentration. With pedestrians everywhere, oncoming traffic from multiple locations and a number of potential hazards at every turn, it’s easy to see why people find it difficult to drive through the centre of town. If this an area of your driving that you need to work on, a set of refresher lessons dedicated to driving when the roads are busy, can do the world of good and the impact of these lesson are increase when combined with a defensive driving course. Parking and reversing are two of the most complicated concepts in driving and it can take a lifetime in some cases to get it right. A significant number of people who have passed their test, struggle in both areas and it’s the most common reason people have for taking refresher driving lessons. You can take refresher driving lessons for multitude of reasons and they really are becoming quite popular among a lot of license holders. If you’re thinking about taking refresher driving lessons and require some advice, fill in the form below and one of our friendly team will give you a call shortly.